Learn how data science and machine learning complement each other by learning how to use data science to approach a problem of image classification. I use both machine learning and data science in my work: I might fit a model on Stack Overflow traffic data to determine which users are likely to be looking for a job (machine learning), but then construct summaries and visualizations that examine why the model works (data science). This is an important way to discover flaws in your model, and to combat algorithmic bias. This is one reason that data scientists are often responsible for developing machine learning components of a product. I'd like to further explore how data science and machine learning complement each other by demonstrating how I would use data science to approach a problem of image classification. 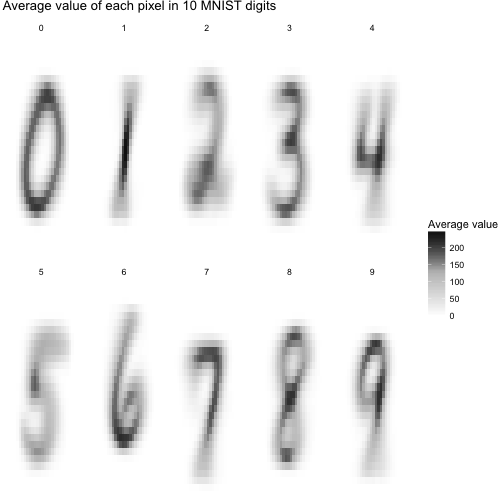 We'll work with a classic machine learning challenge: the MNIST digit database. 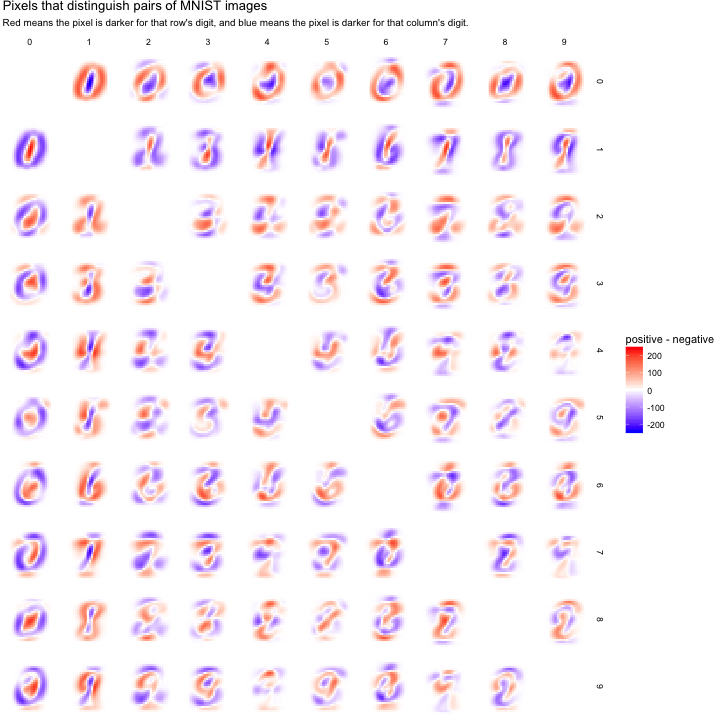 In a series of posts, I'll be training classifiers to recognize digits from images, while using data exploration and visualization to build our intuitions about why each method works or doesn't. Like most of my posts, I'll be analyzing the data through tidy principles, particularly using the dplyr, tidyr, and ggplot2 packages. In this first post, we'll focus on exploratory data analysis, to show how you can better understand your data before you start training classification algorithms or measuring accuracy. This will help when we're choosing a model or transforming our features. The default MNIST dataset is somewhat inconveniently formatted, but Joseph Redmon has helpfully created a CSV-formatted version. We can download it with the readr package. This dataset contains one row for each of the 60,000 training instances and one column for each of the 784 pixels in a 28 x 28 image. The data as downloaded doesn't have column labels but are arranged as "row 1 column 1, row 1 column 2, row 1 column 3..." and so on. This is a useful enough representation for machine learning. But as Jenny Bryan often discusses, we shouldn't feel constricted by our current representation of the data, and for exploratory analysis, we may want to make a few changes. We'd like to represent it as one-row-per-pixel-per-instance. It would be challenging to visualize this default data as images, but it becomes easier once we consider each pixel an "observation." We'd like custom features that have a meaning within the problem. For instance, we don't just have 784 arbitrary features; we have 28 rows and 28 columns. So rather than having labels like "X2" and "X3", we'd like to keep track of variables for x and y (as coordinate positions of the images). We'd like to explore a subset first. While you're first exploring data, you don't need your full complement of training examples since working with a subset lets you iterate quickly and create proof of concepts while saving computational time. With that in mind, we'll gather the data, do some arithmetic to keep track of x and y within an image, and keep only the first 10,000 training instances. We now have one row for each pixel in each image. This is a useful format because it lets us visualize the data along the way. 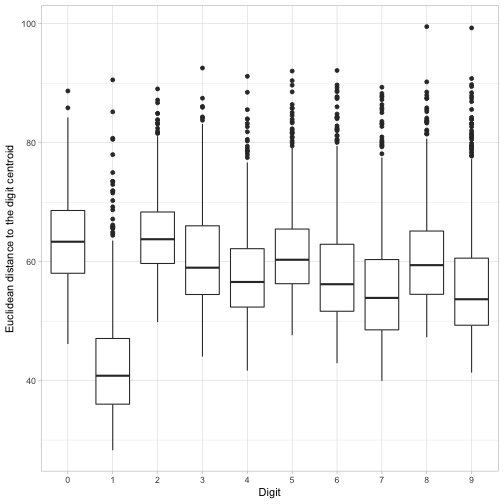 For example, we can visualize the first 12 instances with a couple lines of ggplot2. We'll still often return to the one-row-per-instance format (especially once we start training classifiers in future posts), but this is a fast way to understand and appreciate how the data and the problem are structured. In the rest of this post, we'll also polish this kind of graph (like making it black and white rather than a scale of blues). Let's get more comfortable with the data. From the legend above, it looks like 0 represents blank space (like the edges of the image), and a maximum around 255 represents the darkest points of the image. Values in between may represent different shades of "gray." How much gray is there in the set of images? Most pixels in the dataset are completely white, along with another set of pixels that are completely dark, with relatively few in between. If we were working with black-and-white photographs (like of faces or landscapes), we might have seen a lot more variety. This gives us a hint for later feature engineering steps: if we wanted to, we could probably replace each pixel with a binary 0 or 1 with very little loss of information. I'm interested in how much variability there is within each digit label. Do all 3s look like each other, and what is the "most typical" example of a 6? To answer this, we can find the mean value for each position within each label, using dplyr's group_by and summarize. We visualize these average digits as ten separate facets. These averaged images are called centroids. We're treating each image as a 784-dimensional point (28 by 28) and then taking the average of all points in each dimension individually. 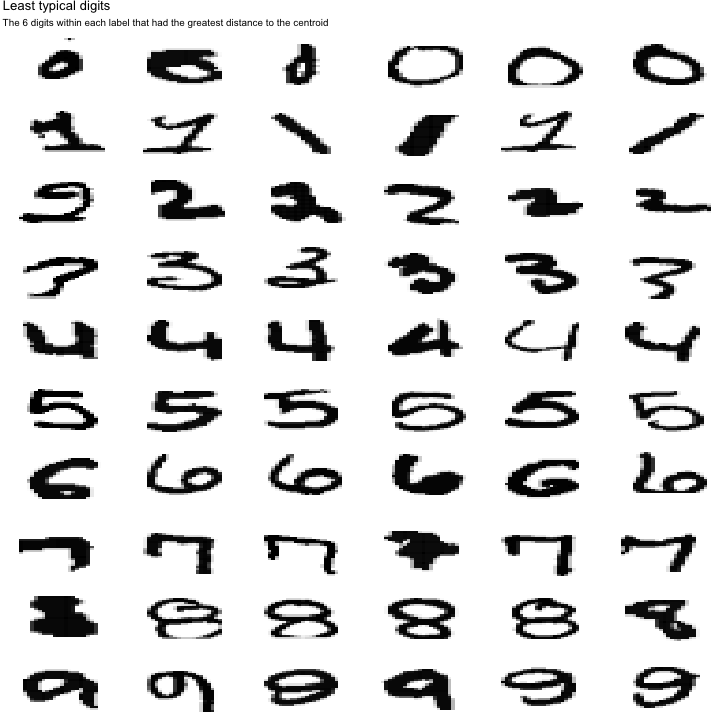 One elementary machine learning method, nearest centroid classifier, would ask for each image which of these centroids it comes closest to. Already, we have some suspicions about which digits might be easier to separate. Distinguishing 0 and 1 looks pretty straightforward: you could pick a few pixels at the center (always dark in 1 but not 0), or at the left and right edges (often dark in 0 but not 1), and you'd have a pretty great classifier. Pairs like 4/9 or 3/8 have a lot more overlap and will be a more challenging problem. Again, one of the aspects I like about the tidy approach is that at all stages of your analysis, your data is in a convenient form for visualization, especially a faceted graph like this one. In its original form (one-row-per-instance), we'd need to do a bit of transformation before we could plot it as images. 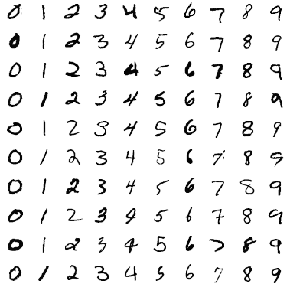 So far, this machine learning problem might seem a bit easy: we have some very "typical" versions of each digit. But one of the reasons classification can be challenging is that some digits will fall widely outside the norm. It's useful to explore atypical cases since it could help us understand why the method fails and help us choose a method and engineer features. In this case, we could consider the Euclidean distance (square root of the sum of squares) of each image to its label's centroid. 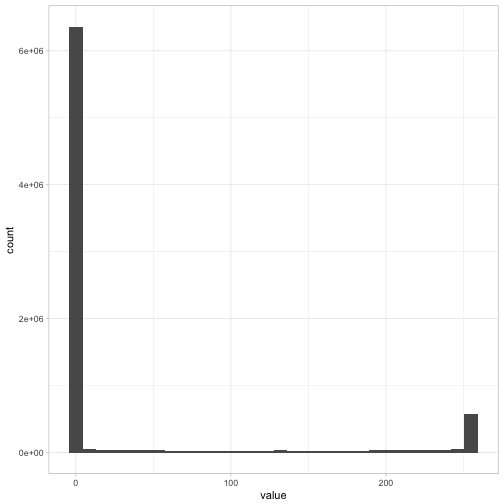 Measured this way, which digits have more variability on average? It looks like 1s have especially low distances to their centroid: for the most part, there's not a ton of variability in how people draw that digit. It looks like the most variability by this measure is in 0s and 2s. But every digit has at least a few cases with an unusually large distance from their centroid. I wonder what those look like? To discover this, we can visualize the six-digit instances that had the least resemblance to their central digit. So far, we've been examining one digit at a time, but our real goal is to distinguish them. For starters, we might like to know how easy it is to tell pairs of digits apart. To examine this, we could try overlapping pairs of our centroid digits and taking the difference between them. If two centroids have very little overlap, they'll probably be easy to distinguish. Pairs with very red or very blue regions will be easy to classify since they describe features that divide the datasets neatly. This confirms our suspicion about 0/1 being easy to classify: it has substantial regions that are deeply red or blue. Comparisons that are largely white may be more difficult. We can see 4/9 looks pretty challenging, which makes sense (a handwritten 4 and 9 really differ only by a small region at the top). 7/9 shows a similar challenge. But a fresh look at a classic problem is a great way to develop a case study. I've been exploring this dataset recently, and I'm excited by how it can be used to illustrate a tidy approach to fundamental concepts of machine learning. 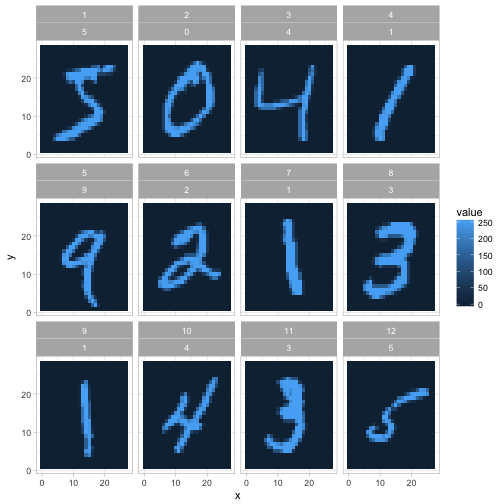 In the rest of this series, I'd like to show how we could demonstrate how we would train classifiers such as logistic regression, decision trees, nearest neighbor, and neural networks. In each case, we'll use tidy principles to demonstrate the intuition and insight behind the algorithm.